This is an ideal villa for the retreat leader seeking to be in close proximity to the daily sunsets at the beach and within the area where all the action in Bali is happening. Being just a minute’s walk away from the main street which is lined with fashion boutiques, novelty shops and souvenir stores makes it ideal for retreats where there will be a lot of free time to explore and to indulge. By being in close proximity to the Eatery Street, a wide selection of restaurants from healthy vegetarian, to casual meals and all the way up to the finest-dining that Bali has to offer, will be at your disposal. For after dark activities, this venue’s location gives you the option to dance the night away at the trendiest bars and clubs near-by, making it an ideal venue for retreat leaders seeking a venue for a retreat full of pampering and fun! Within the villa you will experience peace and quietness while the town vibrantly awaits you. This villa itself is decorated in crafted wooden furnishings, along with certain areas adorned with Hindu and Timor figures and artworks. This villa has seven bedrooms of which 3 of them offer Twin beds. In the main structure of the villa there are 3 bedrooms, which are on the second floor. Two of these open out to a long balcony overlooking the swimming pool and the garden. There are an additional 4 bedrooms which are detached from the main structure of this private villa and located in the garden. Rooms that provide matrimonial beds are of King size, offering spacious comfort while sleeping. All rooms feature air-conditioning, big wardrobe closets and their own en-suite bathrooms which are semi-open and provide rain showers. Assigned to attend to the villa’s daily services is a staff composed of housekeepers, gardeners as well as security personnel. The yoga shala sits near the pool area, in the garden and measures 5m x 15m There are 14 mats, 14 blocks and 14 ropes that are provided when using this space. There are 2 areas where guest may relax with comfy sofas which can be used for group lectures. A large flat-screen TV with a DVD-player is available to watch movies in this space. In the center of the dining rooms sits a large square wooden table that sits 10 people. Adjacent to this space is the fully-equipped, kitchen in another room just behind the bar and dining area. The rooms surround the property’s 25-meter swimming pool. At the poolside wooden deck, there are several wooden lounge chairs which are partially covered by the palm trees, or by a large umbrella. 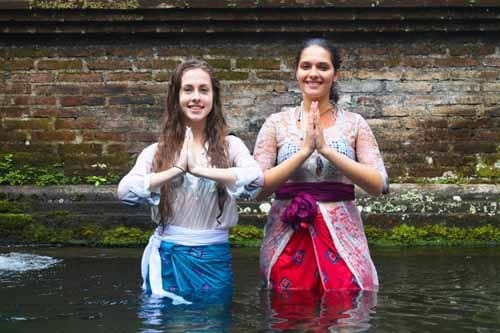 Not only is there plenty to do in the area, but several additional activities that may be included in your program, such as a day excursion in Ubud where a Fire Ceremony or Water Purification can be held. Visits to areas like Tanah Lot Temple or Uluwatu Temple is also highly suggested.